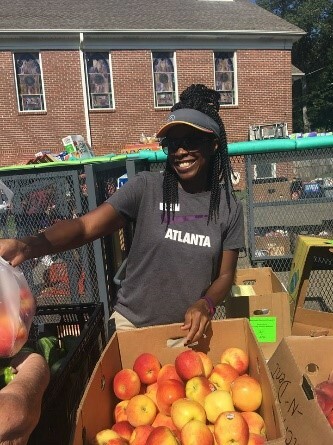 Mobile Food Pantries continue to be Forever Fed’s primary method of delivering food support to the community. Pantries are almost always held outdoors in the parking lots of high need communities. We hold pantries year round, regardless of weather. 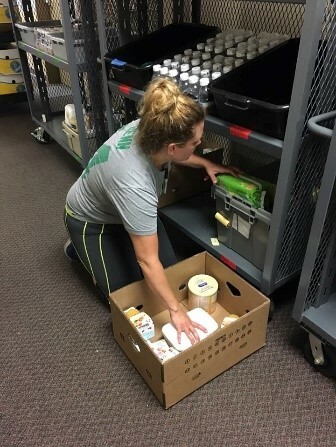 We hold pantries at consistent locations on the same day of the month, each month. In this way we are making small but consistent positive investments in communities experiencing high need. This also allows us to get to know the families we serve while building relationships based on unconditional love and encouragement. Rolling carts with shelves of groceries are transported via our box truck to communities at risk of food insecurity. 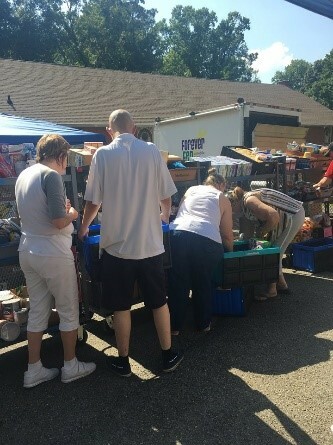 Carts filled with dry goods, frozen meats, produce, and bakery are unloaded and set up for guest to shop. Pantry guests self-select foods they wish to eat from the shelves. Once their shopping basket is full, their food is weighed and recorded, placed in a box or a bag, and sent home with the guest. We allow guests to visit two Forever Fed pantries each month if needed. Forever Fed does not require identification from our guests wishing to receive foods from our pantries. However, each guest is required to complete a short form prior to receiving food. 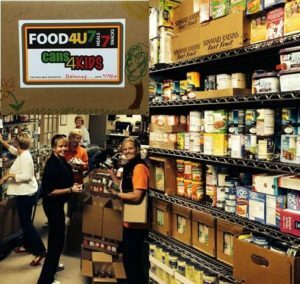 Cans4kids/Food4U Program offers home delivered foods to families in need in Cherokee County, GA. Recipients in need of home delivered foods must demonstrate need, lack transportation, and be unable to visit a food pantry near them. Volunteer drivers deliver foods to these families. Each recipient is interviewed, their circumstance evaluated and food preferences are noted as well. In this way we are all better stewards of the foods we receive and distribute. “Food Drops” are made to various neighborhoods we support experiencing high need. These foods are mostly bakery and produce items with a short shelf life and need to be distributed quickly. We call them “Food Drops” because a volunteer drops boxes of food off at designated areas located in the communities we support. We record the weight of the foods we distribute in this manner. However, people receiving the foods select the foods “at will”, without direct supervision.